The 2010 Top 10 Men's Swim Shorts guide was a bit of a challenge. 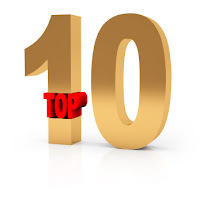 All of the swim shorts that made the top 10 list had to be either a board short style or loose fitting, for the purpose of this list. After reviewing a number of different swim shorts, these brands and ranges came out on top. It was very difficult selecting the order of the Top 10 as each has its strengths. I selected the order based on quality of material, fit, and style. It would be easy to move any of these higher or lower within the top 10, but, as I compare, the order I've determined is below. Prices listed are in US Dollars, though all of the brands will ship internationally. What material to use is an often debated question for swimsuits. While 100% Polyester has similar characteristics to Nylon, it tends not to hold up as well as far as durability or strength of the fibers. Polyester does, however, perform better than Nylon suits in chlorinated water and won't fade as much. The drawback here of Polyester, though, is that it doesn't stretch as much as Nylon does. Con: Deteriorates faster in chlorine and prolonged sun exposure. So, if you're primarily wearing in chlorinated water, you may want to consider the pros and cons of Nylon vs Polyester. Also consider how often you like to buy a new swim suit. If you buy a new suit each year or two, this may be a moot issue. Mundo Unico has designed some impressive board shorts. 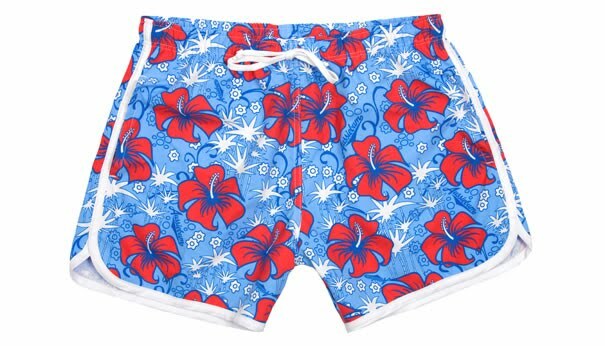 The board shorts are available in five different design patterns: Arrecife (white with brown and blue palms), Pacifico (light blue with stripes down the side and white flowers), Marino (dark blue with white and electric blue palms), Exotico (white with vivid orange palms) and Indigo (black with red and white strips and white flowers). In picture and in person, these are some very attractive designs. My favorite of the 5 would be Arrecife, Pacifico, or Indigo. 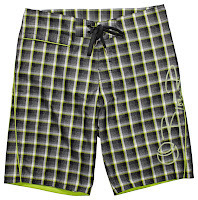 The board shorts are made from 100% Micrel Nylon. The Micrel material has 2 to 3 times more filaments than a regular yarn to give it a fine appearance and feel. The material allows for quick drying. The Unico Board Shorts are unlined for a quicker drying time. Stitching and workmanship is of excellent quality. While the front fly is velcro, Unico adds a bit of extra material to avoid the short and curlys from getting caught. There are two deep front pockets. The pockets are nice for when you're out of the water and wearing them like regular shorts. I would not, however, place a room key or other valuables in them as they would slide out while swimming. Overall, a very comfortable fit. The legs of the board shorts come down to your knees. Uncio does use flat seams so you don't feel the seams. This is important when you're wearing an unlined board short (which most are) and not wearing anything underneath. See my post on what to wear under board shorts. If you’re new to Bonobos, SAVE $50 ON YOUR FIRST ORDER, with this link! Unique to Bonobos is the inclusion of drying straps sewn in to make it easier to hang up to dry. 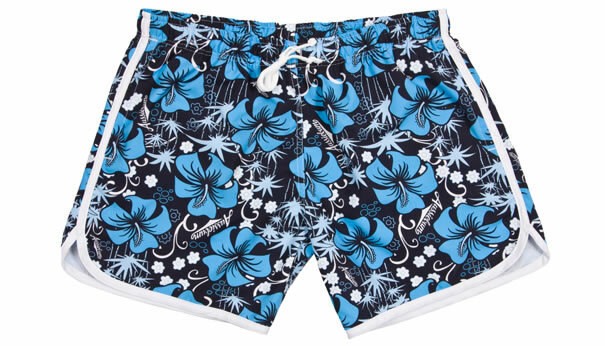 The board shorts are made from a quality 100% polyester fabric. The blend allows for quick drying and retention of shape. The board shorts are fully lined to minimize irritation from seams (not a brief style liner). Bonobos is the only brand that used a zipper for the front fly – I'm sure to avoid the problems with getting caught in the velcro…just be careful getting caught in the zipper. There is a wide piece of fabric that does cover the zipper from the inside to avoid getting caught. 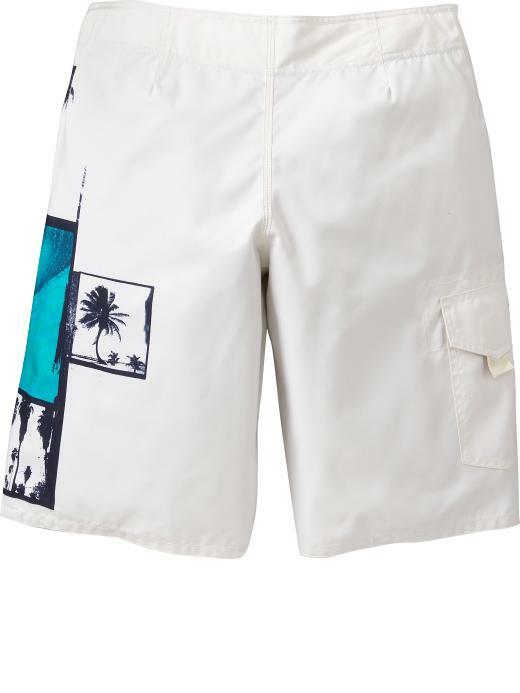 The Bonobos Board Short features two front pockets (mesh) and a snap rear pocket. While I wouldn't leave my room key in my front pocket, you could leave it in the back pocket securely snapped in. The fit was true to size. An added benefit of the Bonobos Board Short is that it has straight fabric in the front (typical boardie look) but has an elastic band in the back to allow for subtle corrections in size. 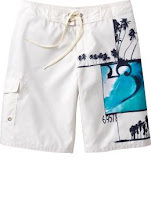 So, you get the look of a board short, but the adjustment of traditional swim shorts. 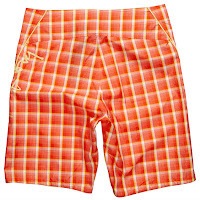 The length of the board short comes to a bit above the knee – 9″ inseam. The new Bondi Series is definitely a retro look with a surfwear print twist. The Bondi Series are a shorter swim trunk, very similiar in length to aB's Scent Ocean range. 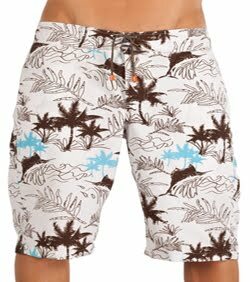 In my opinion, they are still in the comfort zone for modesty for guys that aren't quite ready to move to square-cut trunks but would like them a bit shorter than the traditional boardies. The Bondi Surf Series rests about mid-thigh. As always, I really enjoy the colors and patterns they roll out. The Bondi Surf Series will come in three different colors/designs: Black with blue and white florals, Blue with orange and white florals, and Light Blue with red florals. all of the designs utilize white piping around the legs and sides, giving them the retro look. 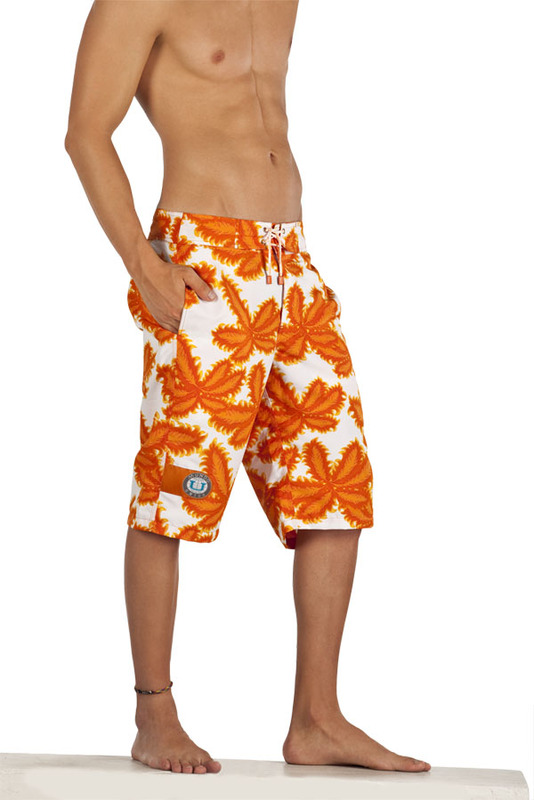 The board shorts are made from a quality grade 100 Polyester. 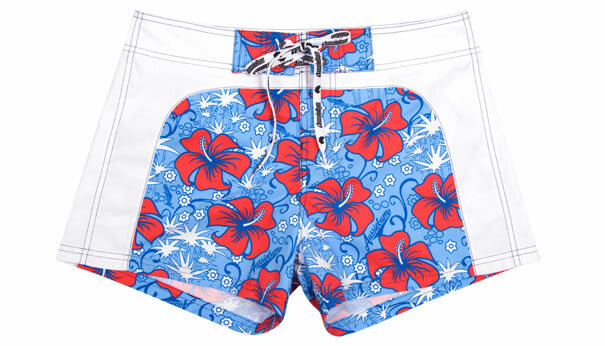 The swim trunks are unlined and feature a gathered waistband with string tie in the front. These were very fast drying. There are two mesh front pockets that are deep enough to be usable -though I wouldn't leave my hotel key in them. A very comfortable fit. The gathered waistband allows for accommodating slight changes in sizing. I really liked how the legs rested mid-thigh. This gave me a comfortable feel and allowed my legs to get a bit more sun. 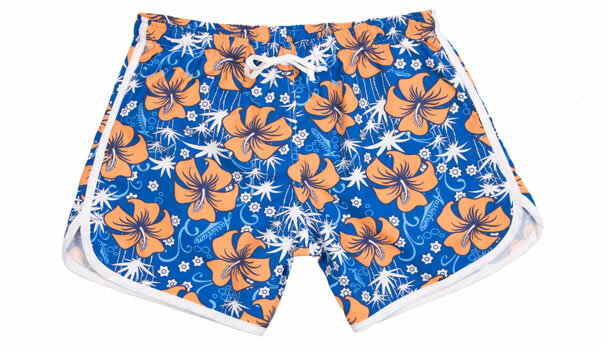 The Timoteo Board Short comes in three designs: Short Floral Map (tan base with brown, orange, and yellow floral print), Short Sapphire Blue (blue base with shades of blue floral print) and Short Tropical (blue base with brown, orange, and white florals). I really like all three patterns and would be pressed to pick a favorite. 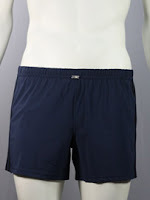 The board shorts are made from a quality 100% Nylon and 100% Tricot for the lining (which is a very find mesh lining). The mesh Tricot lining is a full lining within the board shorts and is not the “brief” style that you may see in a loose-fit swim trunk. The Timoteo fabric was also fast drying. It is quite evident that the Nylon material used is of high quality. The Timoteo Board Short does not have any pockets. As stated above, the Tricot lining covers the entire inside of the board short but is not sewn to be supportive like a brief. The purpose of the lining is to mediate any irritation from the seams. The Timoteo Board Short does not use flat seams. This, however, is not a problem because of the lining. The Timoteo Board Shorts use the typical velcro fly. There is not extra material to avoid getting caught so do be careful pulling them on. The board shorts reviewed were not in my size so I cannot comment on fit; however, in my experience with Timoteo, they should be true to size. Stick with the sizing guide. 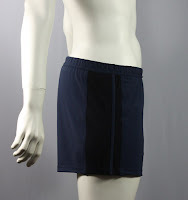 The Sport Swim Boxer by JM was also a fine pair of swim shorts. The overall style, cut and feel of the Sport Swim Boxer is very similiar to a pair of athletic shorts. In fact, while the material blend is similar to Unico's, the weave of the material creates a whole different feel – much like a pair of nylon athletic shorts. 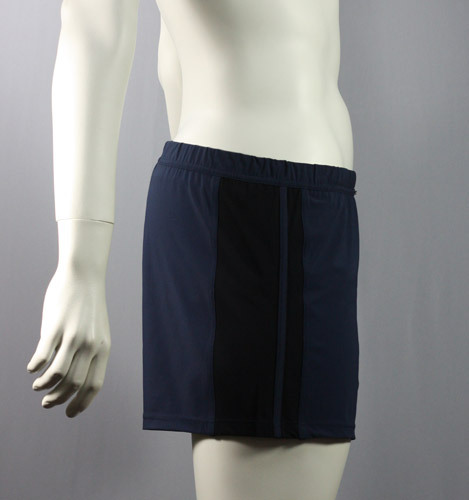 The swim shorts are made from a quality weighted blend of 80% Nylon and 20% Spandex. The blend allows for quick drying and retention of shape. The JM Saddleback has a drawstring waistband, which makes it easy to adjust, and has a mesh inner liner (like a built in brief). The mesh inner liner is similar to what you'd find in traditional loose-fitting swim trunks. The JM Sport Swim Boxer does not have front pockets but does have a small inner pocket large enough for a hotel key. 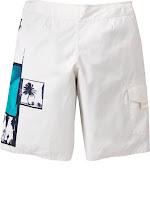 Bjorn Borg does it again with their Tour du Lac Surf Shorts. The cut and style is that of a traditional board short – resting just at the knee. 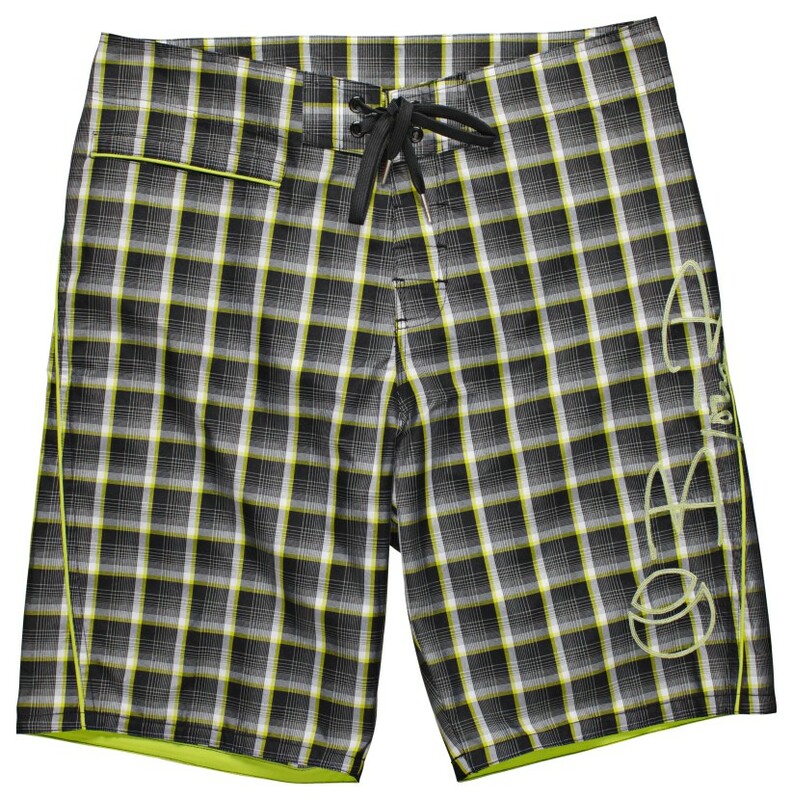 The check styling of the swim trunks are quite nice and really like the large Bjorn Borg stitching across the left leg. While more expensive than the other swim trunks, they are of excellent quality and use double stitching. The board shorts are made from a quality grade of 100% Polyester and are quick drying. Front pocket on right leg. The Tour du Lac fit quite well and was typical for a board short. The waist is tied wtih the traditional string through two grommets on each side. aussieBum's 60's Shorts range just received some new looks. The original 60's range utilized white sides with a patterned design on the inside. My sneak peek features black on the sides with a design/pattern in the inside – a very handsome, masculine look. Double stitching, flat seams, and quality material make this a fantastic pair of swim shorts. 60s or 2010, here we come! Expect to see these on the aussieBum site in a few weeks. 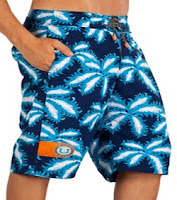 The board shorts are made from a quality grade 100% Polyester, same as the aB Bondi Surf range. The 60s Shorts feature a partial lining (brief style) for support and comfort. There is a single rear pocket that would comfortably carry a hotel key or anything else. The pocket as two grommet holes on the bottom for drainage. On top, the pocket is securely sealed with velcro so your key, or whatever else, doesn't fall out. A comfortable fit. The partial (brief style) line was comfortable and supportive when wearing during more active sports, like volleyball, versus just wearing as swim shorts. 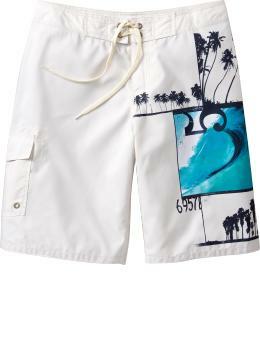 The 60s Shorts are a shorter board short and similar in length to the Bondi Surf range. I like the look and feel of a traditional board short. The 60s Short gave me the same comfort but with a more attractive look. I like the shorter legs of the 60s Short and that it allows my legs to get a bit more sun. The JM Classix Loose Fit Short is a very nice swim short. As a loose fit short, the JMs are a traditional men's swimsuit – which aligns with it being part of the Classix Collection. The overall look and style is quite attractive for the conservative man. Front and center on the waistband is the JM logo for a more distinguished look. The board shorts are made from a excellent blend of 72% Meryl Nylon and 28% Spandex. The blend allows made for quick drying and is very light weight. The Classix Loose Fit utilizes a mesh inner liner (brief style). The only pocket is a small mesh one sewn into the liner, large enough for a hotel key. The overall fit of the Classix Loose Fit swimsuit was quite comfortable and fits like a classic swimsuit. The gathered waistband with inside tie was comfortable and allows for easier variances in waist sizes. As described, the legs are loose fitting which allows for easier leg movement, especially for beach volleyball, and measured 13″ from top to bottom. The suit also features flat seams, though not really needed with the inner liner. The Andrew Christian Swim Shorts are a handsome men's swimsuit. The red, white a blue, along with the silver cross embroidery certainly does give these shorts a nautical look. 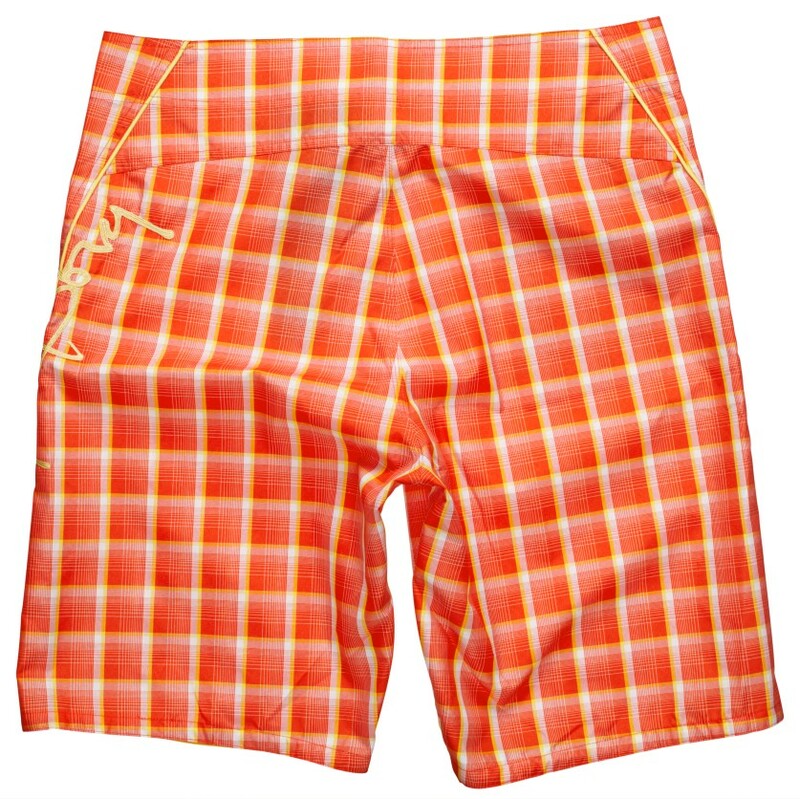 The swim shorts are made from a quality weight and weave of 100% Polyester Microfiber. The swim shorts do feature an inner liner (brief style), appropriate for the style of swimsuit. While the material is heavier than some of the others, it did dry rather quickly. The swim shorts have two small front pockets. The pockets could hold something temporarily but are not deep like traditional short pockets nor do would you want to put a room key in. I do like the aesthetic look of the front pockets, especially with the white accents for the pockets. The sample I reviewed was not in my size and cannot not comment accurately on the fit and feel of the shorts. Based on my prior experiences with Andrew Christian and the measurements of the pair I reviewed, you should be safe following the sizing guide. I typically find Andrew Christian to fit well and comfortably. One thing I can say for Old Navy, is that they are incredibly well priced. Listed at $19.50, I've seen these on sale for as low as $10 a pair. Surprisingly, even with the insanely low price, they are fairly well made. I really like the huge variety of styles that Old Navy offers; pretty much something for everyone's taste. The board shorts are made from a decent 100% Polyester material. 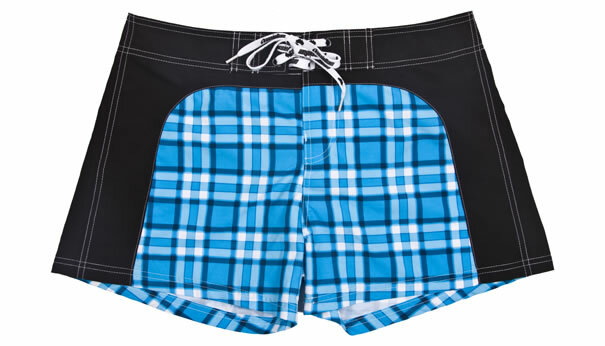 The board shorts are fully lined to prevent irritation from rubbing against the seams. I found the material to dry rather quickly – not quite as fast as the others, but certainly in a respectable amount of time. There is a small pocket on the inside for holding a hotel key. There is also a cargo pocket on the right let with a grommet drain and a snap for securing things from falling out. I found the Old Navy Board Shorts to fit quite well and liked the length of the legs (11″ inseam) which rests about at your knee. The Old Navy Board Shorts also have unique design for the fly. The fly is velcro, but they have a cloth fabric which protects you from getting caught in the velcro (remember to read what to wear underneath your board shorts). The sewn fabric does make the fly useless for using, but really, who uses the fly – most guys pull down a bit and go over the waistband.